Here’s a confession. To be honest I’m not really that naturally organized person, who just has to put everything straight back after using something. I really, really wish I was that organized person! I think I’m more of the type that’s probably born messy (if that’s possible? ), but who would like nothing else than to actually be organized! Searching Pinterest for organizing ideas, is SO my happy place! Race your hand anyone that can relate, haha. Organized kitchen drawer? Yes, please! I’ve always dreamt of having a really clean, tidy and organized kitchen, where EVERYTHING has its own dedicated spot. Unfortunately, the reality is somewhat different from my organized dreams! Right now I think you could say our kitchen drawers and cabinets are more like a nightmare than a dream, that’s for sure. Have a look. Here you see we got all kinds of different boxes and containers, and really just a great selection of chaos going on. Not at all that organized kitchen drawer that I’ve been dreaming about! To my defense, it’s only been a few months since we moved into our new house. A lot of the kitchen supplies, foods etc were just placed in drawers and cabinets where we could find available storage. But I think it’s just so incredibly exhausting, to literally having to turn the drawer upside down each time you’re looking for something. And I’ve really lost count of how many times I’ve bought more sugar, and then later on to find 3 packs of sugar hidden in the way back of the drawer or cabinet. But now that we’re finally starting to settle into our new home. I really see the need for a more organized system in the kitchen. So it was about time we got more organized in the kitchen again! And the first project was to finally get an organized kitchen drawer, the drawer where we store all our dry food. 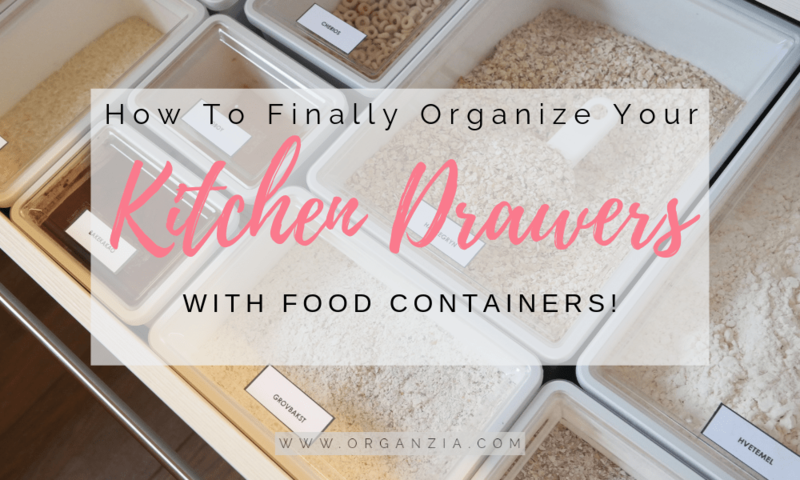 How I finally got my organized kitchen drawer! I knew I wanted containers in different sizes, and with a see-through lid so we could easily see what was in the drawer. I went looking in some different stores, but couldn’t really find what I knew I was looking for. Of course, IKEA ends up saving the day! Is there really anything you can’t find at that store?I love these containers, just what I was looking for! The containers are from Ikea’s series called TILLSLUTA. They come in a range of different sizes, and they’re all a perfect fit and can also be stacked. So I ended up buying some large containers, some tall containers and a couple of small ones as well. 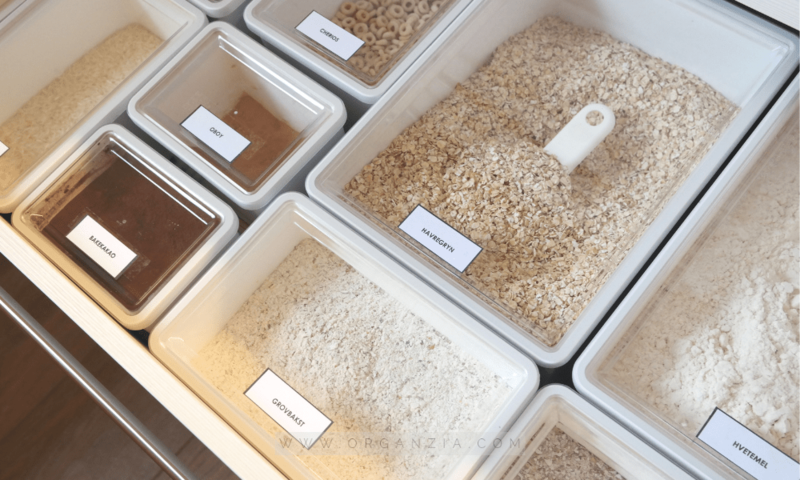 I bought the container sizes that would work out best for the different dry food I wanted to store, such as spaghetti, rice, flour, cereal, oatmeal and so on. I made sure to properly measure the drawer before I bought the containers, just to be sure that the containers would fit. And of course, it’s always a good idea to make sure to fully take advantage and maximize the use of the storage space in the drawer. And this is how my organized kitchen drawer turned out in the end! Isn’t it just pretty?! I LOVE it, and it’s super easy to keep. Mostly because I’ve used EVERY single inch available in the drawer, so there’s actually no room for it to get messy again. I also decided to make some simple labels to put on the lids. On the labels I wrote down what was inside the container, cooking instructions and other relevant information. You can use a simple program such as MS Words or Canva to design your own labels, and easily have them printed out on these. So finally my dreadful kitchen drawer is no longer a horrible nightmare, but just the most organized drawer in the entire kitchen. Really loved how it turned out! And now there’s only the rest of the kitchen to tackle… let’s just save that for another day I think! If you’re anything like me, perhaps you love to cook and also enjoy buying all sorts of spices and herbs? But maybe you end up not knowing how to actually store them all. Sounds familiar? 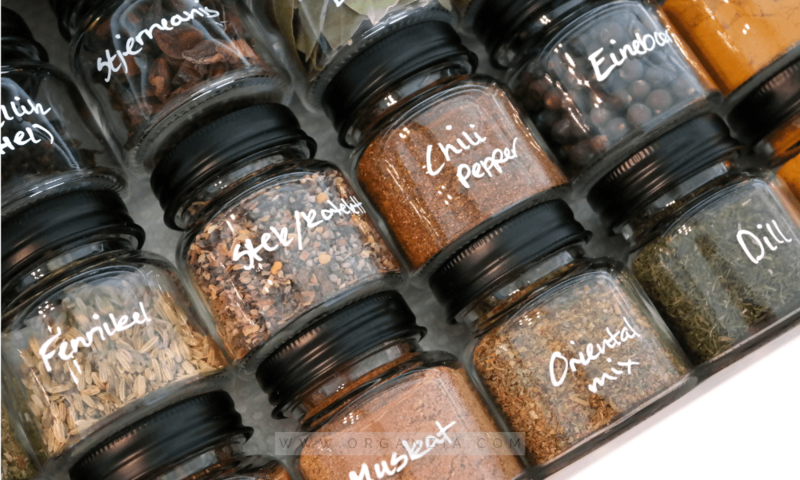 If thats the case, make sure to also check out how I easily organized my spice drawer, here. If you enjoyed reading this,(which I hope you did!) 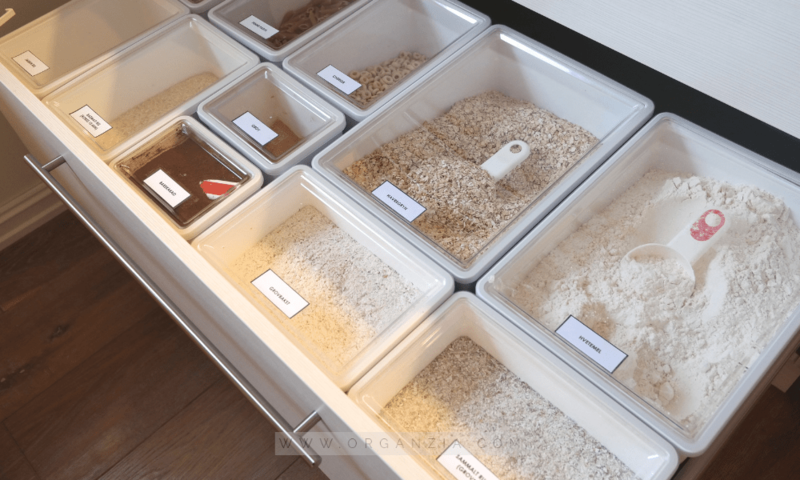 But you’re still craving more kitchen organizing ideas, have a look at 6 Simple Tips For That Organized Kitchen You Dream About! Is there anyway you can tell me the sizes of the container you bought for this drawer? I see them on ikea but would like to insure that I can duplicate this drawer. I have a 36” wide drawer I can do this in. 🙂 TIA !! Hi, Gwen 😀 Here’s the links to the exact containers I used. Thank you so much answering. I was actually wondering how many you used in this drawer and their sizes. Also the size of the drawer? I’m thinking it may not be enough to get it totally fitted looking like yours. Thanks for being so helpful. I just love the way your drawer looks so flush and everything totally fitted. It almost looks like custom insert! Thank you! Love the look of this drawer, makes me kinda happy every time I open it 😉 I hope your drawer turns out the way you want it! Hi Carmelie! Unfortunately, Ikea has now discontinued the Tillsluta product line 🙁 You can maybe have a look at the 365+ line for similar food containers. So clean and organized. Well done. Oh this looks so gorgeous! Wonderful idea, feeling inspired! Thank you Iryna ? I’m glad to be able to inspire you! You sure have inspired me with that gorgeous pantry of yours ? I love this idea! I am writing a post about drawer organization, and I would love to use one photo with a link back to this post if that is OK with you. Thank you Nicki! 🙂 Sure you can include a picture and linkback in your post, no problem! Have you found that the seals on these containers are airtight? I love this idea.. also, do u take them out to use or just scoop from the drawer?